Say "Hanoi Mee". Say it out loud, over and over again. Do you hear "annoy me"? Well, you're supposed to. The name is a joke between Vietnamese chef Ennis Le and Aussie co-owner Malcolm Bond. Le wanted a moniker that signalled his country of origin, Bond wanted something that any random Port Melburnian could wrap their mouth around. They went back and forth until they annoyed each other into Hanoi Mee. The origin myth is a cute metaphor for the approach here, which is anchored in Vietnam but dabbles in contemporary techniques and tantalising trends. It's not annoying at all. The free-thinking approach to food is backed up by a good cocktail menu: I loved my friskily heady tumbler of cinnamon whisky, tamarind and kaffir lime syrup. The interior is an exuberant melange of Hanoi handcrafts and street scene murals. The booths under an indoor canopy are the pick of the 45 seats. Come summer, the pavement dining will catch the sea breeze. Le left his job as head chef of Elwood's much-awarded Dandelion to open his first restaurant and he's brought some old favourites down the beach to Port Melbourne, including a braised and deep-fried crisp pork hock, seafood spring rolls in crunchy lattice rice paper and a coffee creme caramel. Hanoi Mee doesn't quite have Dandelion's polish but the food is fresh, balanced and flavourful and it's cheaper too. Snacky dishes fill half the menu. Turmeric pancake is folded over a mix of mushrooms and roasted cauliflower rather than the traditional pork and prawn. It's jaunty and light. 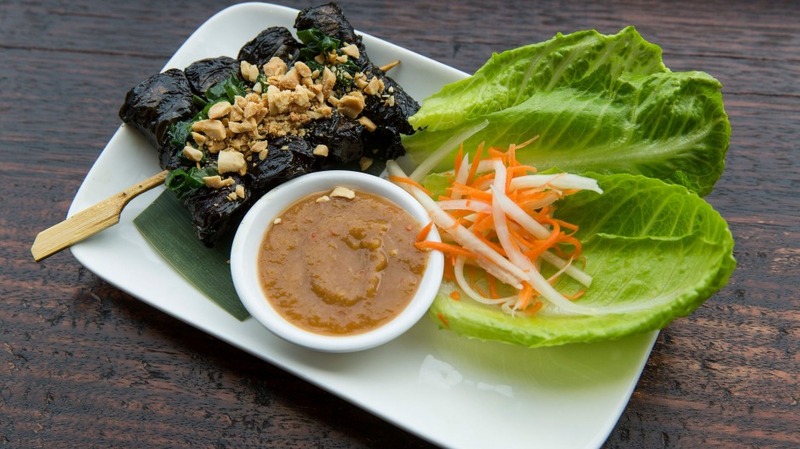 Bo la lot (minced beef wrapped in betel leaves) is made with premium wagyu mince and served with a sauce of pineapple, chilli, anchovy and ginger: it's a street food snack dressed up for a party. Every restaurant needs its fried chicken these days; Hanoi Mee uses ribs, which means a good ratio of crunchy crust to sweet meat. They're served with on-trend sriracha mayonnaise. If your conscience says salad but your belly says "feed me!" 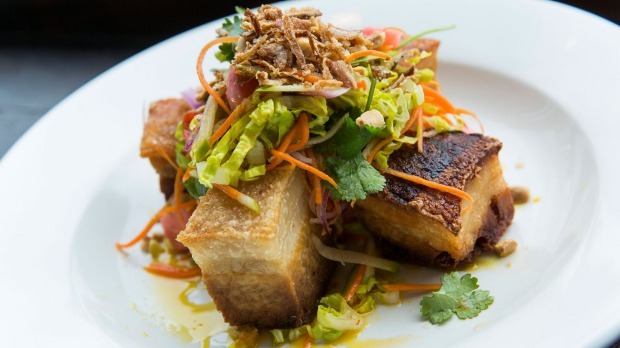 then go for the pork belly salad, which is really just beautifully cooked sticky pig topped with a riotous rumble of apple slaw, chilli and peanuts. Pork and apple is a tried and true combination but Le also adds a mandarin dressing with palm sugar and fish sauce, bringing a gentle, seasonal citrus note plus a little south-east Asian punch. I'm a sucker for wrapped dishes because they feel like presents; open the salmon in banana leaf and you'll find the fillet topped with a fun fusion pesto of dried tomato, chilli, cashew and coconut. The dusky reds of the paste and the muted pink of the fish make a pretty palette, amplified nicely by the sweet tang. It's a winner. French colonists left lots of culinary baggage in Vietnam; creme caramel is one dish that stuck. 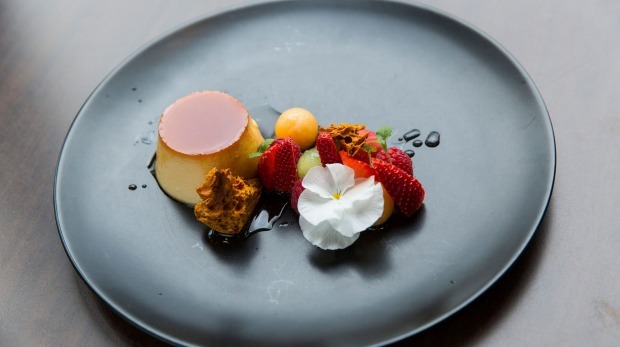 Le does a version with Vietnamese coffee and serves it with honeycomb and fruit on a striking black plate. It's a simple dish but thoughtful, balanced and joyously cross-cultural, which makes it rather emblematic of Hanoi Mee as a whole.